This NASA-produced map shows areas that were warmer and cooler in July, compared to the 1951-1980 average. July 2016: Another month gone by, another batch of high-temperature records, according to the two federal science agencies that keep track of these things. Both NASA and the National Oceanic and Atmospheric Administration, which use somewhat differing data collection and calculation methods, announced in recent days that they had concluded last month was the planet’s hottest July on record (dating to 1880). 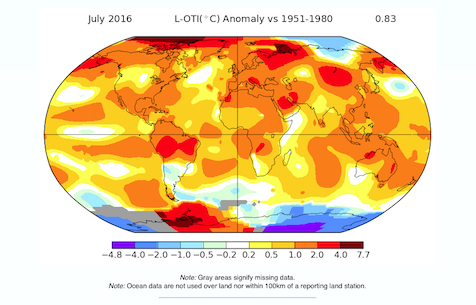 The previous hottest July and hottest month was July 2015, NASA and NOAA said. Under NOAA’s methodology, last month was the 15th month in a row to set a monthly heat record, averaged across the planet. It was the 10th month in a row to set an average high-temperature record in NASA’s calculation. According to NOAA, last month’s temperatures around the world meant the first seven months of 2016 had the highest average reading for any January-July period on record. Climate scientists attribute the earth’s recent string of high-temperature records largely to manmade global warming and partly to a cyclical El Niño weather pattern that was recently declared to have ended. Climate Central reported that NASA’s Gavin Schmidt, director of the agency’s Goddard Institute of Space Studies, expects July will turn out to be the last month this year with a record high global temperature. 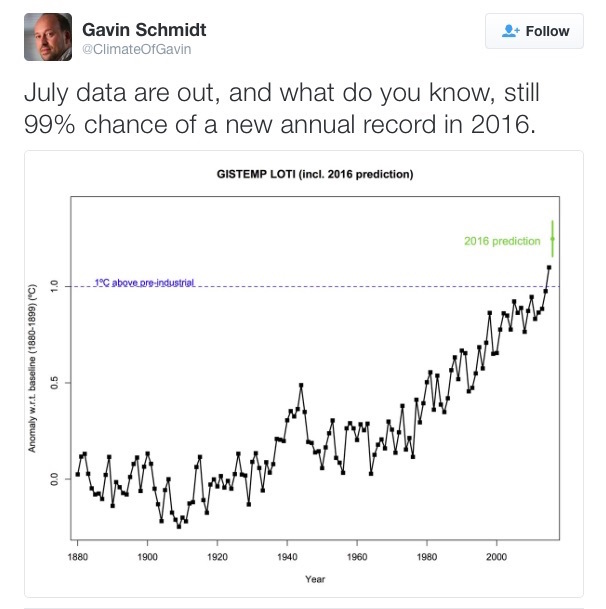 But Schmidt tweeted that 2016 is still all but certain to end as the new hottest year on record, surpassing last year’s record. Bill Dawson is TCN’s editor.